In the following chapters on diamond color we'll be showing you how these colors actually look as they are graded and compared side by side to other colors in the lab environment. The traditional way of grading color was to simply take the diamond in question and lay it alongside a known set of master colors, comparing them side by side in daylight fluorescent lighting (northern daylight) to determine their color grade. 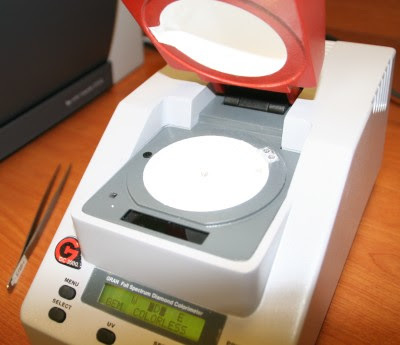 While this is the method still utilized in the labs today there have been some companies that have introduced technologies that will digitally measure the color of diamond and calibrate the machines to GIA standards. 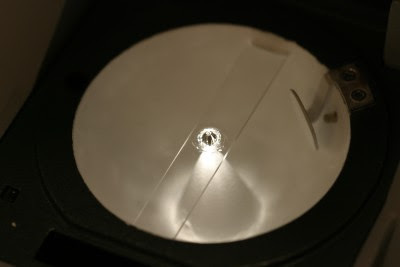 On round brilliant cuts it works so well that we employ such technologies when we're double checking diamonds that arrive in our lab to consider for purchase. 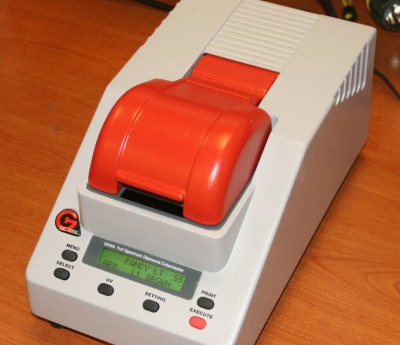 One of the more reliable units we've tested and use is the Gran Colorimeter. 1. How accurate is the Colorimeter? A properly calibrated Colorimeter grades round brilliant cuts extremely accurate.  At Good Old Gold we will test and double-check diamonds every day and the grand majority of the time it is very reliable and line up with the labs grade. If we see questionable results however we also check against master stones. This unit is now in it's 3rd generation and we've been using it since it was first released in the 1990's. 2. Can fluorescence skew the results? 3. 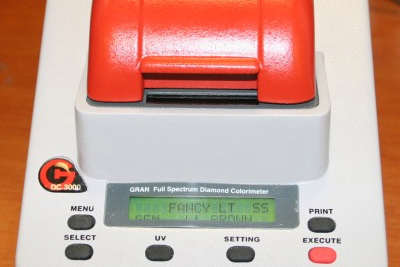 Does the Colorimeter work for fancy colored diamonds? It does but not to the point of distinguishing the differences between the intensity of fancy colors (ie. Fancy, Fancy Dark, Fancy Intense, etc.). 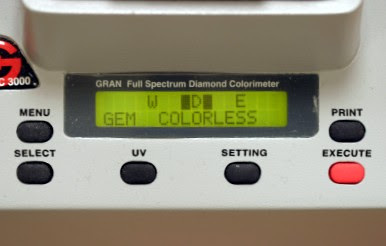 Below is a picture of a diamond that is a fancy brownish/yellow and it's correlating colorimeter results. Note the DC3000 rates it a fancy b-YELLOW for fancy brownish-yellow. 4. When the Colorimeter disagrees with what is on the Lab Report which is more correct? We actually find that in most instances the Colorimeter is! Bear in mind this is not to say it is a "flawless" technology.  Our method of color grading does not rely upon this technology alone nor should it ever be for any diamond grader. Nothing trumps human observation. Here is one example below where the Colorimeter trumped the lab report though! Note the two diamonds in the graphic below. 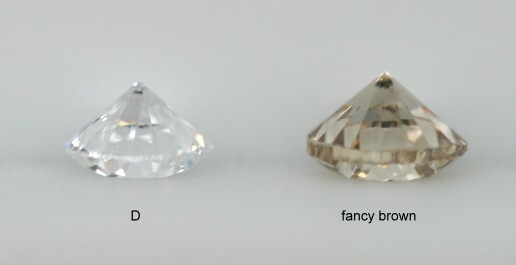 Both of these diamonds were graded "J" color by a conservative lab yet it is pretty easy to note more saturation of color in the diamond on the right. 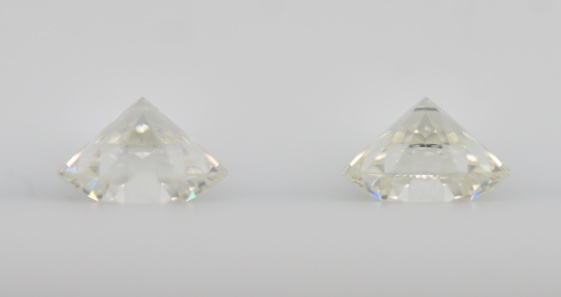 Here are the colorimeter results of these 2 diamonds. 5. Do you ever catch labs making mistakes in your favor too? 6.  What would you consider the limitations of the Colorimeter technology? It sometimes has trouble distinguishing between D and E colors. I'll also say it's virtually useless when it comes to fancy shapes. We'll strictly use it on round brilliants only. If we ever use it on fancy shapes it will not be for an accurate color grade but strictly for identification purposes. Now that you're more acquainted with color grading and this particular technology follow this link to "Colorless Diamonds" to learn more.